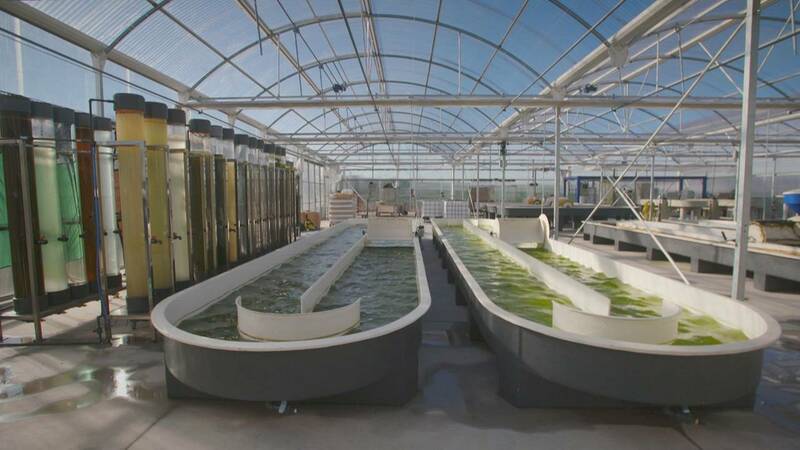 At a European funded research project in Northern Spain, scientists think that microalgae could start a revolution in the food and cosmetic sectors. Euronews’ Julián López Gómez visited the research centre where the microalgae are being cultivated. Four particular microalgae species are being examined at the research centre in the city of Gijón, Northern Spain. They are able to produce Omega-3, a fatty acid used as a dietary complement. The antioxidant also is used in the cosmetic industry. But before anything, the microalgae need to be taken good care of. David Suárez a biologist at Neoalgae described that process to Euronews. "Microalgae are mini plants. So to grow, they need a constant source of light, either natural or artificial. Temperature is, also, very important for them. We use a greenhouse to create stable temperature conditions for them. Ideally between 15ºC and 20ºC. And the third crucial parameter is the agitation. Microalgae need to be in constant movement, so light reaches the whole organism, this is what makes the metabolic process more efficient". Scientists contributing to this European research project use a complex method to extract both the Omega-3 oils and antioxidants. They say no chemical solvents are used. Carbon Dioxide is used to break through the membranes protecting the compounds inside the tiny algae. Neoalgae food scientist Víctor Casado Bañares explained the extraction process. "We inject carbon dioxide into the microalgae at very high temperature; pressure can reach up to 300 or 400 bars. We obtain a soluble solution that contains both the gas and the microalgae oils. We then release the solution back to normal atmospheric pressure. CO2 is released into the air or recycled for further processes. Being heavier, microalgae oils stay at the bottom of the container and we can recover them." Fish is the top source of Omega-3 fatty acids, but extraction has been considered inefficient and unsustainable. Most fish species are fully exploited or over-exploited. Scientists like Biologist María Álvarez from the Neoalgae research project are convinced that microalgae are a more viable alternative. "Omega-3 concentration in microalgae is much higher than in fish. It’s crucial to understand that the Omega 3 from microalgae is much more natural. Fish do not naturally produce Omega3. It basically accumulates it by feeding on microalgae. So through this process, we are just going straight to the primary source of Omega 3". The company has already marketed both dietary supplements and cosmetic products based on Omega-3 and antioxidants extracted from microalgae. Neoalgae CEO Ignacio Albert wants to make production more competitive in an ever-changing market. "The technology is currently expensive, so the resulting products are costlier than others available in the market. But prices should moderate when we start scaling up the technology. We, also, hope European legislation will evolve, and it will make it more difficult to extract these products using chemical solvents. At that moment, our more sustainable technology will become more widespread, and the prices of the products will decrease". Scientists here estimate the global demand of Omega-3 to total around 260,000 tons per year. A market is seemingly ready to be conquered by microalgae.